Nick’s Exchange and Scripting Blog: Exchange 2007 and Outlook 2003: Where are my attachments? Exchange 2007 and Outlook 2003: Where are my attachments? A few months ago, I received a phone call from one of our college IT administrators inquiring about emails with missing attachments. At first I thought he was referring to attachment types that we block with ForeFront (e.g. executables, scripts, harmful files). However, when he started complaining about intermittent missing jpg attachments I started investigating further. I had users forward the messages with missing attachments to me and I could see the attachments just fine. I opened the user’s mailbox via OWA and again I could see the attachments. It wasn’t until I visited the user’s office that I was able to see (and believe) the problem. Outlook 2003 would display the message, but no indications that it contained attachments. After a little troubleshooting we were able to determine that Outlook 2007, OWA, and IMAP clients were able to display all the attachments properly. "The issue seems to be caused by our Content Conversion engine setting a MAPI property on the message to tell Outlook to “hide” the attachments. The code only seems to do this if the MIME is formed where the Content-Disposition MIME header is set to “inline”. This is definitely a change in behavior from Exchange 2003…"
In English: A bug exists in Exchange 2007 when a message with ‘inline’ attachments is delivered. This bug causes Outlook 2003 to not display the message attachments correctly. In my last correspondence with Microsoft they said that the code has been fixed for Exchange 2007 SP1 and a ‘backport to RTM’ has been accepted. Here’s to hoping they have a hot-fix soon. View the attachment in OWA: OWA correctly understands how Exchange 2007 stores attachment information for the message. Open the message and save the attachments: This one is a little counter-intuitive. Even though Outlook 2003 doesn’t display the attachments, it can still access them. By selecting the ‘Save Attachments’ option from the ‘File’ menu will allow you view and save the attachments. Forward the message: This gives you 2 options. 1) Forwarding the message to yourself will display the correct attachment information in the new message. 2) When composing the forwarded message you will see the attachments. Flag the message: ‘Flagging’ the message will cause Outlook 2003 to write information about the message to the Exchange database. This process will cause Outlook 2003 to set the appropriate information so that it displays attachments correctly. Have the sender send ‘real attachments’: Since the problem only exists with ‘inline’ attachments the sender can change their mail client to send ‘real attachments’ and avoid future problems sending attachments to your organization. **Note: Mozilla mail clients send ‘inline’ attachments by default when composing HTML email. Instructions for changing this behavior can be found here. Update: Update Rollup 3 for Exchange 2007 fixes the issue mentioned above. Thanks for this! I was pulling my hair out on this one. I just received confirmation that MS will release a private hotfix for this. In the future it well be taken in the rollup package that is released every 8 weeks. I have received notification of the same thing but I have not yet received the private hotfix. Hopefully this will be be available as part of a rollup package soon publicly. Thanks for posting this. Despite all of their attachments being crap forwards, it was driving some of my users batty. When MS will release this hotfix for this problem? Anonymous: I believe this problem is only win incoming mail. I have tried sending 'inline' attachments to exteral users from Outlook 2003 and everything worked as expected. Griinis: Microsoft is currently working on a 'private fix' and I expect it to be released in a update rollup before SP1. There have been a lot of people asking for the patch. Can anyone verify that the hotfix is out? Another thank you for figuring this out and posting it. What a weird problem. Can somebody help me with this :I need to connect mac entourage 2004 with latest updates to exchange 2007. I can connect to the server, but I can't see any folders in this account. What I need to configure in my exchange to allow connect mac users ? Thank's a lot ! Try setting the 'Exchange', 'Exchweb', and 'Public' virtual directories to use basic authentication and restart IIS. Do MS have an article about this on the website? any news on the hotfix? I have not seen a support article from Microsoft about this yet. I asked about the private fix a week ago and was told that they are still working on it. I have verified this issue is fixed in SP1 beta 1. If you have an other questions, feel free to email me at k.nick.smith at gmail.com. I am leaving for vacation but I should have access to email. Does anyone know if there is a hotfix yet? Exchange SE is close to releasing the testfix which WILL work on Exchange 2007 RTM but there are a few issues on Exchange 2007 RTM + Rollup2 (KB935490). a) Update rollup3 is due to be released in Early July this issue will be fixed in that version – can the customer wait for this? Thanks for the followup. You seem to have better insider information than I do. Any additional updates? We are experiencing the same problem. Is calling PSS of any use at this point? I still don't have the private hotfix and at this point I am just waiting for the update rollup in July. To be honest this as become a non-issue for us since our users are aware of the workarounds. I'm getting the same problem, but I'm using Outlook 2007 as well. Are you able to view the attachments in OWA? Is this just an Outlook issue for you? I'm having the same type of an issue with my users not receiving email attachments. The confusing difference that I'm seeing, is that my company is using an exchange 5.5 server and the client is Outlook 2003, any of the other versions of Outlook that we use to test this are receiving the attachments. All of the work arounds that have been posted here are working. My question is does this hotfix also apply to the exchange 5.5 or is it just for exchange 2007? Any help would be greatly appreciated. Interesting reading but unfortunately it did not help my problem. I am using Outlook and when I started using AVG Free Anti-virus, no attachments and body-messages were being delivered to my mailbox. The only thing on the email was that it was "scanned by AVG" ( don't have any other AntiVirus) I had switched from McAfee to AVG because the former was slowing my PC badly whilst the AVG is very efficient. As a workaround, there are 2 options. Does anyone out there know of a simple solution to ue "Outlook" and AVG at the same time?? Brilliant! Thank you so much - that's fixed the problem for me. thanks for the post and the link to the rollup-patch. As the descriptive Article of MS does not contain too much information, it is quite hard to find. But now I've got a hook. Has anyone had this issue resolved by installed Roll up 3? we had installed the roll up on our exchange servers and this is still happening. Same here. Do we need to uninstall and re-install ? This rollup fixed all of our probelms. Are you having problems with certain attachments or all of them? Are the attachments of a file type that is automatically blocked by Outlook. The trick to seeing if you are affected by this problem is to forward the message. If you see the attachment in the forwarded message then this is your problem. If you don't see an attachment in the forwarded message then you most likely have experiencing a different issue like Outlook blocking that file type natively or A/V software on the Exchange servers is configured to block those file types. still have the issue with sp1 rollup 3 installed. Not an AV etc issue. When send to a mailbox on a 2003 exch server all is well. We are running Update Rollup 5 for Exchange 2007 and Outlook 2003 SP3. We have just recently been advised of this issue. Initial investigation showed that a user was supposed to receive 2 PDF attachments but could not see them. Properties of the email suggested that they were there (size). Printing the email displayed icons for both attachments. 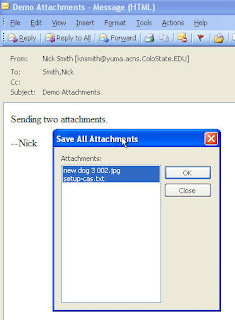 Opening up the email in OWA displayed the attachments and opening them from OWA confirmed that they were not corrupt. All other recommended work arounds failed to display the attachments (Save Attachments, Forward etc). Also Message Headers do not have the "Content-Disposition: inline;" line as indicated in MSKB 930468 for this issue. As we are already at Update Rollup 5 is this the same issue or something else? Is there anything else we can do to resolve the issue? Like you we're fully patched on Exchange 2007 and users with both Outlook 2003 and 2007 are having this problem. Were you able to find a solution? Thanx for the info, very in depth and helpful! we also have a Problem with two PDFs not shown in Outlook 2003 SP3 as described by Alain last September. Non of the know workarounds work. Opening the mails in OWA shows the attachments. In my case it had to do with the configuration of the exchange server. * In the Exchange Management Console open "Organization Configuration" -> "Hub Transport"
* Click the tab "Remote Domains"
* Open "Default" and goto the tab "Format of the original message sent as attachment to journal report:"
This setting prevents the use of Exchange rich-text format, which is the cause of the problem. The formatting, HTML or RTF, of the actual mail is not lost. Today I had problem with mails,and me advised good program-export folders from ost file,tool is free,it extract your data and export Outlook ost file, if *.ost file is corrupted,export from ost file is very easy to use, its friendly graphic interface allows all operations to be performed in several mouse clicks,really works for export mail from ost file and is capable to recover *.ost files,export mail from .ost file supports all Windows platforms as well as Vista and all versions of Microsoft Office packages,tool can export ost file without Outlook and export data from ost file to pst, as well as to recover emails and contacts from password-protected *.ost files, it is even possible to process source files with strong encryption and export folders from ost file. We have exchange 2007 sp1 roll up 7 and we are till having this problem. It is something to do with the mime type of the email, if it is set up multipart/related Outlook doesnt know if attachments are inline or normal. The matter is that this problem solves with help next software-outlook express errors,but fortunately as far as I know application is free and has many facilities,it can resolve data corruption issues for Outlook Express email client,works with one of the most vulnerable elements of information systems,helps and it does not matter, what happened with your mailbox,works with Outlook Express versions 5, 5.5, 6 and all currently supported versions of Microsoft Windows operating system,preview all messages, that can be successfully retrieved from corrupted files with dbx extension,recovery of all emails from your mailbox in dbx format, if these dbx files are seriously corrupted and Outlook Express there was an error opening this message,will save separate files of eml format, that can be accessed by any email program. Today I saw that my outlook doesn't work,because my password was lost,and accidentally I found in inet-outlook password open.And fortunatley tool helped me fast.It is free as far as I know,besides that it will help to retrieve current user password Outlook and restore access to your email account. My girlfriend was working with MS Outlook and accidentally deleted my important mails.I was sad.But not long after I found-how to recover overwritten outlook pst file.Tool helped me very effectively.It is free as is known.Besides that application can recovering pst files from Microsoft Outlook does not modify the source file during recovery process. Open Outlook, Open a new e-mail msg. Click the round "Office" button in the top left, click "Editor options" box in the lower right of this window. Click Advanced in the left menu, scroll down to the "Display e-mail content" section and ensure that the "Show picture placeholder" is unchecked. Close and open Outlook to apply this to all new msgs. Thanks to Greg and Dave for the backup on this one! I'm going to guess that this is an issue? Just rolled out to Exchange 2010 (but still using Outlook 2003) and we are experiencing this exact same issue. I'm having the exact same issue with Exchange 2010. Except so far, OWA is the only thing that works. Same problem as well, with Exchange 2010. Outlook 2007, IMAP and OWA all work fine. Outlook 2003 doesn't show the attachments when the mail is signed. If I flag the message the attachements show up. If I open and "save all attachment" it works as well. it seems like we got the same issue on Exchange 2007 SP3 RU3. Can anybody confirm this? I only found confirmation for Exchange 2007 (no version given) and Outlook 2007: http://support.microsoft.com/kb/961940/en-us. But if I give this to the customer he'll tell me, that he doesn't use Outlook 2007, so it's not an Exchange-Bug but my fault. My bosses computer sometimes, not consistently, doesn't receive attachments that I (in house) or others send to him. I upgraded him from Outlook 2003 to Outlook 2007 and the problem continues. I tried the save attachment, forward, and other round abouts and nothing showed up. Any ideas? Do you know if this will be fixed in Outlook 2010? I often use Yahoo's web mail server to read and write e-mail, move sent e-mail from my Yahoo sent box to Yahoo inbox, and later download it all into Outlook 2010. When I send a PDF attachment to someone and later download my own e-mail, Outlook 2010 shows the clippy icon saying that there's an attachment, but Outlook 2010 doesn't display the attachment itself. Outlook 2010 sometimes works and sometimes doesn't work. I doubt very much that the server side matters at all (Exchange or Yahoo or anyone else). I looked at Yahoo web mail again and the attachment is really there. Nice information by the blogger...Good job..
It’s actually a great and helpful piece of information. I’m pleased that you just shared this helpful information with us. But sometimes user faces some issues in HitBtc exchange account. If your HitBtc exchange you're unable to fix out this not working issue then no need to worry contact to hitbtc support 844-617-9531 and get instant online assistance for your HitBtc exchange account related issues. Office.Com/Setup It is very easy to setup Microsoft Office Setup on your Window PC, Mac computer, laptop, or mobile devices. The process of Microsoft Office 365 setup includes downloading, installing, and activating the product. Nice information thanks for sharing. If you want to open a Kraken Support number+1888-712-3146 explanation, then it is related to opening an account on any other proposal. Signups are not going away to be anonymous. Your article is easy to understand, For all of these known issues, you can contact numbersonweb, the 24x7 technical support team at CEX.IO Support Number +1-888-712-3146. We are happy to help you. Get Connect with yahoo support number team by dialling +1-855-375-6777 and resolve you are all kind of technical errors.Yahoo Customer Support and Yahoo Technical Support is available 24x7. If you face any type of facebook problem and want to get support, then in this situation you can dial our third-party toll-free facebook support number . Our facebook customer support team is 24*7 available for users to provide support and suggestions for any type of query. Get the best tours and travel packages deals at AmazingIndiaTours Book your Holidays packages online for domestic & international destinations. Get Kraken Customer Service ASAP! As the trend of cryptocurrencies is increasing and new users are entering into the world of digital currency. Kraken Support Phone Number Call Now: +1-888-712-3146 (toll-free) for Kraken Helpline Phone Number +1-888-712-3146 and services. This is trusted Kraken Customer Support Numbers provide instant support. Thank you such a great amount of sharing for useful significant post. Numerous individuals will benefit from this post in their business Great Job, Keep it up. If you have a major problem related to Atomic Wallet then you should get advice by our worldwide best technical support providers. We provide best customer service our services are available 24/7 for our customer. You can also contact us at Our Atomic Wallet Support Number is +18443312333. We have superb ideas and solutions and you get instant support on 24*7 our website. Thank u so much for the information with us, Nice info about Outlook not receiving some emails. if any customer getting Outlook account issues for technical related then just click at read outlook more.